EQ has twice the power of IQ to predict performance. 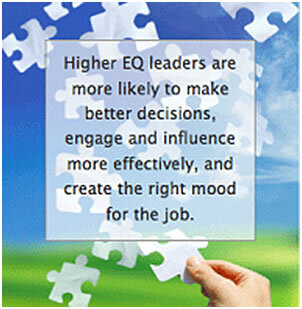 EQ is also a better predictor of performance than employee skill, knowledge or expertise. Increases profitability and reduces costs associated with turnover, absenteeism, and low performance. Improves personal and social competencies. Results in better school attendance, higher grade point averages, and higher academic achievement. Decreases antisocial behavior and aggression, results in fewer serious discipline problems and school suspensions.